This one, mercifully, has closed. OK, it has been established that San Francisco has more than its fair share of lousy cheeseburgers, but it seems that they are actively seeking to best the worst by bringing in international competitors. 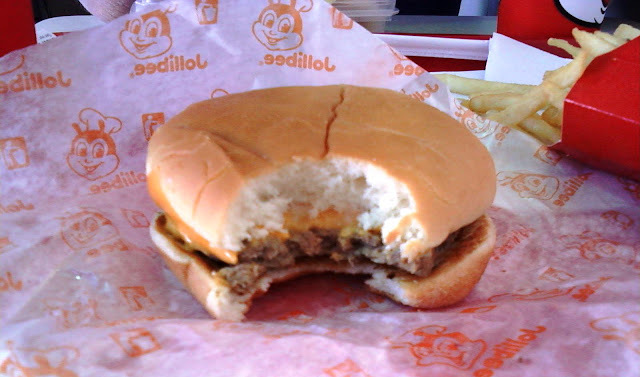 Enter Jollibee--the Philippines answer to crappy burgers. Ready...Set...Terrible! Jollibee was our futile, last ditch effort to find a morsel of burger goodness in San Francisco. That effort resulted in complete failure. 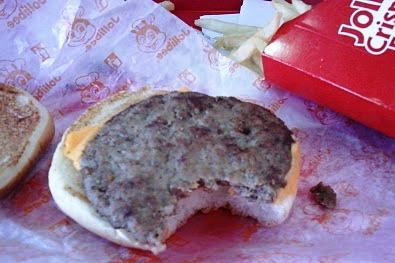 The Jollibee cheeseburger was mercifully small, but it packed a wallop of crappiness. Steamed, rubbery, salty, searless--just craptastic. Oddly, this sliver of crap could not compete with the grinning evil on a bun delivered by Cafe Zuni, though. It was barely worth reviewing--it was just a cheap, low-quality, unpleasant, highly processed bit of fast food awfulness. The seasoning was overwhelmingly salty. The bun was thin and flabby. The whole thing was a PASS. Also, the fries sucked, but they weren't as crappy as the fishy mess served up at the Mission Beach Cafe. What the eff is that little bee smiling about? The fact that he served you a turd, and you paid 2 bucks for it, that's what. Burger Review : Weak--do not want. That looks like something you'd get in a school cafeteria. Point well taken, CrazySpeareshake. On a positive note, I had an EPIC Filipino burger at the Neri's Curbside Cravings truck in LA. That was crazy delicious, and the Pan de Sel bread was perfect.